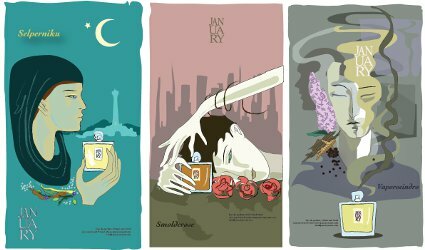 Sometimes the way to my nose is actually through my eyes: I was initially tempted to try Vaporocindro when I saw January Scent Project's retro-styled illustrations by the line's perfumer, John Biebel (who's also a visual artist). They remind me a bit of Guerlain's classic 1935 "Is She Your Type?" advertisements by Elise Darcy, with a surreal twist. I like the overall dreamy mood of the Vaporocindro image (shown above right), plus the sinuous lines of scent encircling the androgynous central face and the mysterious profile to the left. January Scent Project's visual materials also allude to the fragrances' notes, and with this image we're given a preview of this scent's "wood, spice and flower" profile. Vaporocindro's composition includes notes of lilac, green leaves, apple, turmeric, black pepper, jonquil, mahogany, cedar, agar, davana, black currant, cumin, coffee, sandalwood and ambergris. In addition, the "vapor" and "cinder" of the scent's Esperanto-like name hint that this isn't going to smell like a mainstream fragrance. Vaporocindro's florals appear up front, with a honeyed lilac. The floral theme doesn't stand alone for long, though: it's quickly joined by a sharp fruity note, a thread of smoke, a hint of something mineral, and lots of black pepper. The smoke, in particular, makes me think of Vaporocindro as an "industrial lilac," as though I'd stumbled across a lilac bush growing in an abandoned factory yard, rooted in gravel and dusted with soot. For its first hour or so, Vaporocindro is pretty intense and would likely draw attention from anyone nearby. Its dry down is more subdued: the smoke dissipates, allowing the woods and spices to emerge (and if you're not a cumin fan, don't worry — it's not strong enough to dominate). Hours later, I'm left with a muted but very pleasing blend of lilac and jonquil. We've left the factory yard; now I feel like I'm indoors, looking at a vase of cut flowers in a dimly lit room. (The gray-tinged colors of the Vaporocindro illustration are very accurate for this scent.) The sillage gradually diminishes; the staying power is above average. As you've probably guessed by now, Vaporocindro isn't a typically feminine or springlike lilac; it feels nothing like Dawn Spencer Hurwitz La Belle Saison or Frédéric Malle En Passant. It's a more experimental, dirtied-up take on the flower. Back in October, Angela wondered, "Could 2017 be the year of the deconstructed tuberose?" Borrowing that terminology, I'd call Vaporocindro a "deconstructed lilac." It's probably not for everyone, but it should appeal to those who are in the mood for something unexpected this winter. 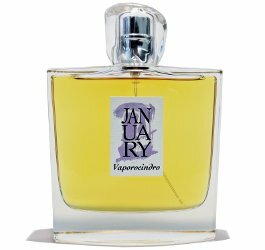 January Scent Project Vaporocindro is available as 100 ml ($125) and 30 ml ($65) Eau de Parfum. Sample sets are also available. For purchasing information, visit the January Scent Project website. Wow…this sounds like a must-try…it’s so hard to find a “tough-a**” lilac perfume! Kevin, I thought of you, actually—because I remember that you were disappointed in the lilac fragrance from La Parfumerie Moderne! This one definitely has more “grit”! The images are great, aren’t they…so much more interesting than generic model+perfume photos. The perfume sounds terrific. Yes!! Earlier in the year, I gave an illustrated lecture on perfume advertising, with examples from the early 1900s through the 1990s. Someone asked me to mention a few of my recent favorites. It was hard to think of many…at least, ones that anyone would remember from a magazine, etc. Niche fragrance imagery like this is much more interesting than mainstream perfume ads! Hi Jessica, I’m curious about those Elise Darcy ads for Guerlain. Was the idea that there was a perfume each for blondes, brunettes and redheads, or something? And do you know much about Elise Darcy? Well, now that I’ve looked more deeply…it seems to be JACQUES Darcy. The internet is wrong! My apologies. There isn’t much information about him…although he seems to have also collaborated on Art Deco theater designs and interior decor in his time. Maybe I need to do a little more research on this! Ah, that explains why there are scant references to ‘Elise Darcy’ as a graphic designer of that era. Pity. I was intrigued. I fell in love with January Scent Projects’ Selperniku. It really does smell like butter and sandalwood. Every time I wear it from a sample I giggle. I’d love to own a coffret of this line! I have a sample of Selperniku and I’ve been enjoying my sniffs of it…although I haven’t tried it on skin yet! I’m glad that this line offers sample sets and small (under $100!) bottles. I wish all brands did this. The presentation of these scents is rich with imagination… how beautiful! Probably the most interesting line I’ve seen this year and so appealing in a sea of minimalistic niche offerings in their clean, white boxes with sans serif typefaces, or the never ending supply of mainstream scents usually done up in pink and black. I love the packaging, the bottles, the artwork and really look forward to trying these. Well done! Thanks for the review! I’ve tried all the others in the line but this one. My favorite is Eiderantler followed by Smolderose EDP. I need to dig out my samples and wear them again. Smolderose parfum oil was the only one that just didn’t work on me. I’ll eventually need to seek out a sample of Vaporocindro.